1) Wash the car, and dry the water drops on its body. 2) Shake the container of MARPA Colour Back Wax completely. Shake the bottle periodically during application. 3) Pour some MARPA Colour Back Wax on the sponge; rub it on the car body to form a thin layer of wax on the surface. 4) To remove remaining stains and dirt use more MARPA Colour Back Wax. 5) After 5-10 minutes, wipe the surface with a soft and clean cloth. Do not use MARPA Colour Back Wax when the body of the car is hot, it is under the direct hot sun, or it is in a dusty place! Sometimes the car paint may attach to the sponge and form a dark layer on the surface during polishing. To avoid such cases, wipe the dry wax off the surface! 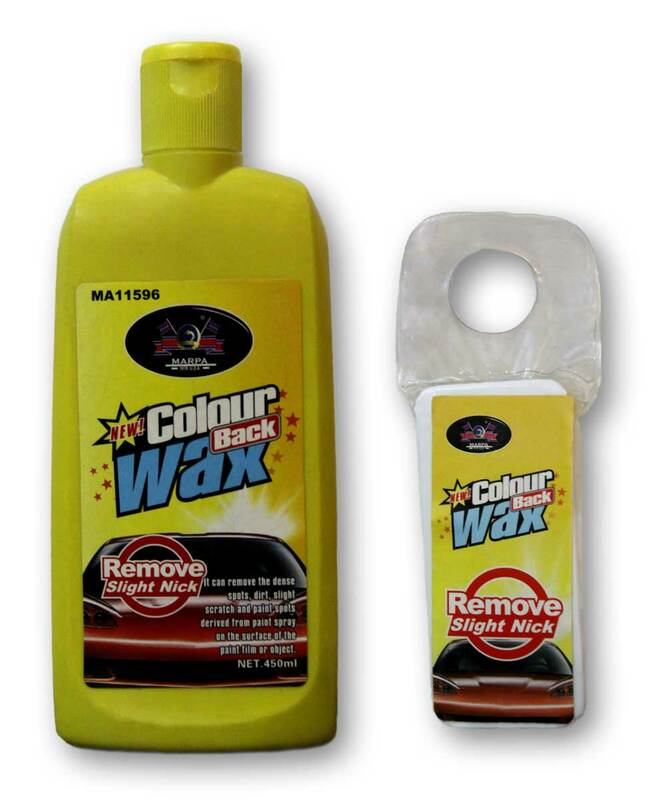 Do not use MARPA Colour Back Wax on unpainted surfaces, large resinous spots, and glass and plastic objects! Keep MARPA Colour Back Wax in a cool and dry place (with a temperature between -5 and 45 ° C), away from heat, flame, and direct sun light! Do not put the bottle of MARPA Colour Back Wax near the front or back windshields; and keep it away from hot air outlet of the car! MARPA Colour Back Wax bottle is recycled after it is completely used up. For eye contact, flush with clean water for 15 minutes and consult a physician! If swallowed, induce vomiting and call a physician immediately! If skin contact made, wash with soap and water! Keep MARPA Colour Back Wax out of reach of children and animals!